Prior to last week, the focus was on the 5,200-square-foot interior of the new Can’t Stop Smokin’ Bar-B-Q restaurant at 7250 W. Chandler Boulevard in Chandler, which has involved multiple truckloads of logs, all hand cut on site. According to General Manager Nick Jaquez, this construction represents the casual, mountain feel the restaurant is incorporating, as it is now finalizing the exterior and preparing to introduce the first Arizona location of Can’t Stop Smokin’ to the East Valley May 3. The focus will be the restaurant’s signature, 20-foot-long hotline counter that will showcase a variety of healthy, high-quality, smoked barbeque meats, including beef, pork, chicken and turkey, all prepared fresh daily with homemade, preservative-free seasonings, and then smoked on-site for between three and 13 hours. Each is served deli-style with a choice of Classic or Southwest Spicy barbeque sauce. Also available: a salad bar (offering “power greens”); beef and turkey jerky; numerous side dishes beyond the standard coleslaw, baked beans and corn-on-the-cob; and desserts like homemade, pies, cookies and cobblers. As it prepares to open, Can’t Stop Smokin’ is posting regular construction updates on its website (www.CantStopSmokin.com), and on Facebook (CantStopSmokinBBQChandler), and is finalizing the hiring of outgoing, energetic people to serve the restaurant, which will seat up to 140 guests. In New Mexico, Can’t Stop Smokin’ was recently named “Best BBQ” by Ruidoso News and “Client of the Year” by New Mexico State University in Alamogordo, N.M. In Chandler, the new restaurant will be open seven days per week, from 10 a.m. to 10 p.m. For more information or to learn about franchise opportunities call 888-99 SMOKIN (76654) or visit www.CantStopSmokin.com. If you are looking for somewhere unique to have dinner or brunch this Mother’s Day weekend, where the restaurant ambience, entrées and service leave you already wanting to return, then you are looking for Phoenix City Grille! Set in the Madison neighborhood of Central Phoenix at 16th Street and Bethany Home Road, Phoenix City Grille is consistently recognized for its delicious menu combinations, unique daily specials and personalized, attentive service. – Catch of the Day: Pan-Seared Alaskan Halibut with a Candied Ginger-Champagne Buerre Blanc, Griddled Red Quinoa Cakes and a Shaved Fennel-Strawberry Salad. In celebration of the end of tax season and the extension of Tax Day to April 17, P.F. Chang’s will reward guests nationwide with a 15 percent discount on April 17. The special one-day deal encourages P.F. Chang’s diners across the country to celebrate the end of tax season with extra savings. The Tax Relief promotion includes all guests of P.F. Chang’s China Bistro and applies to every dine in and take-out order. On April 17 only, all food orders will be discounted 15 percent. The discount is not valid with alcoholic beverages or Happy Hour food and beverage items. *The Tax Relief discount will be applied automatically to all applicable checks. Offer not valid on Large Party take-out or delivery and not valid with any other offers, discounts or gift card purchases. Truffles in the Arizona desert? Help them become a reality. Italy are impossible to obtain because they spoil too quickly. successfully maintain the truffiere for the first 10 years of operation. legacy truffle orchard in the Southwest”, stated Aaron Eckburg, cofounder. the Arizona agriculture and viticulture communities and economies. Posted on April 8, 2012 Categories Aaron Eckburg, Arizona, desert, Dutchman's Truffiere, Indiegogo, TrufflesLeave a comment on Truffles in the Arizona desert? Help them become a reality. This Easter, Bluewater Grill Seafood Restaurant will offer both its regular lunch menu plus an Easter Brunch menu on Sunday featuring a variety of seafood-inspired breakfast favorites created by Executive Chef Andrew Capek. Menu items include the Bluewater Benedict, which features crab cakes served over a toasted English muffin topped with poached eggs and citrus hollandaise sauce; the Bagel and Lox, with smoked lox of Nova Scotia salmon served on a cream cheese bagel with red onion tomato, fried capers and hard-boiled eggs, or the Roasted Oysters with bacon and quail eggs. Additional items include a yogurt and seasonal berry parfait; bay shrimp ceviche, or a build-your-own omelet, plus eggs any style with bacon and sausage. Prices range from $6.50 to $14.95. In the bar area, the restaurant will offer Mimosas and Champagne by the glass or bottle, as well as its signature Build-Your-Own Blue Ice® Bloody Mary Bar, which gives customers the chance to create their own customized version of the famous all-day cocktail using Blue Ice® vodka and their choice of 25 hot sauces from around the world. Brunch is offered at Bluewater Grill on Sundays from 10 a.m. to 2 p.m. and advance reservations are recommended. Bluewater Grill is located at 1720 E. Camelback Road, on the site of the former Fish Market restaurant in central Phoenix. For more information call (602) 277-FISH (3474). Tucked up in the desert amongst golf courses and the growth of north Scottsdale is the 431 room Zona Hotel and Suites. To coincide with a renovation that started in the summer of 2011, they also have re-branded the restaurant that is on property calling it, Graze Desert Grille. Emphasizing the cuisine of the Southwest, Executive Chef Kevin Myers uses the ingredients sourced from local farmers and suppliers and using all natural ingredients. Food and Beverage director Brian Blanke will compliment the food by featuring Arizona wines, spirits and beers along with other selections. I recently had the opportunity to taste several items from the new menu to debut April 5th, 2012. The evening started with select cocktails of our choice including Flagstaff’s High Spirits Distillery gin for Martinis. If your a fan of corned beef hash you won’t be disappointed by the Corned Beef & Green Chile Hash that comes topped with an Sunny Side Up egg. tasty and with a hint of spice this is a good way to start your day. 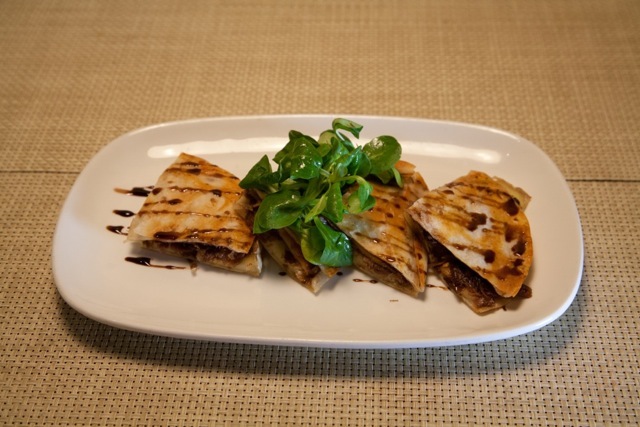 I enjoyed the Duck & Brie Quesadilla that includes duck confit, caramelized apples and Brie cheese and drizzled with Balsamic vinegar. A nice combination of sweet, creamy and savory make this a unique take on the classic appetizer. Locally grown vegetables are the stars of 2 of the salads I tasted, The Rocket Salad uses Arugula that is tossed with dried apricot, aged Manchego cheese, pistachios and oregano dressing. The Beet Salad is complimented with Purple Haze goat cheese, baby lettuce and a hazelnut vinaigrette. Both salads are flavorful and make for a great light lunch or as a start to your dinner. 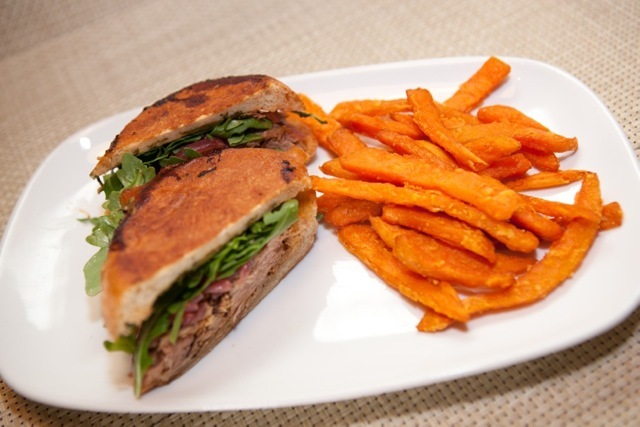 Pressed Pulled Pork Sandwich uses in house seasoned and smoked pork that comes served on a locally baked Ciabatta rolled and is topped with Arugula, sweet and sour onions and a Guajillo pepper aioli. This was one of my favorites of the evening and comes served with thick cut, crispy French fries. Two of the entrees were tasted on this evening and I recommend both of them. If you’re in the mood for fish the pan seared Grouper should serve you well. The white, flaky fish is served over a bed of spaghetti squash, it is drizzled with smoked tomato butter and comes with braised greens that offer a nice contrast to the other ingredients. 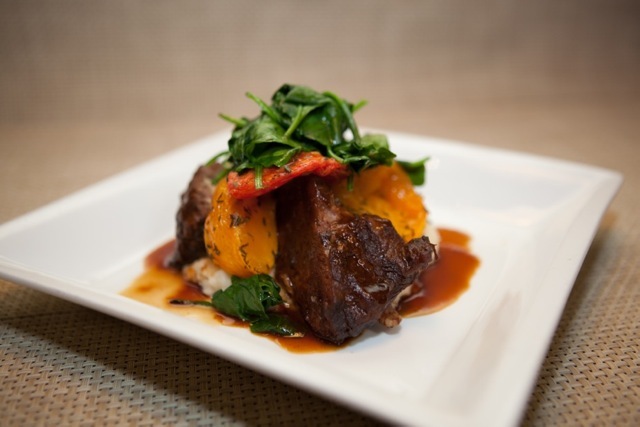 If red meat is part of your plan the Whiskey Braised Shortribs is not to be missed. Placed atop a pile of white cheddar and chive mashed potatoes, it comes with spinach from local farmers markets, an oven roasted tomato and its own juices pour over it. Tender and flavorful the meat is very good. All courses were paired with the wines from Arizona Stronghold Vineyards with the exception of the pork sandwich which was paired with Lake Havasu City’s Mudshark Brewery’s Scorpion Amber Ale. The wines all tasted very good and were paired well with the food. National Sales Manager Paula Woosley joined us to talk about the wines and the success Arizona Stronghold and the Arizona wine industry is enjoying. Set in the Madison neighborhood of Central Phoenix at 16th Street and Bethany Home Road, Phoenix City Grille is consistently recognized for its delicious menu items and personalized service. In fact that is part of what makes it the perfect place for diners looking for a comfortable and memorable place to enjoy Easter Sunday brunch! This year, Phoenix City Grille will once again serve its “Southwest Meets Comfort Food brunch” on Easter Sunday from 10 a.m. to 3 p.m. Southwestern menu items include the restaurant’s signature griddle corn cakes with jack cheese and chicken, bacon or ham; beef Machaca tostadas with scrambled eggs; stacked green chile chicken enchiladas with fried eggs; four different types of eggs Benedict (grilled ham, pork tenderloin, crab cakes and carne asada), bread pudding French toast, quiche, and braised beef short ribs, served with a panko-breaded egg. Every day of the week Phoenix City Grille offers a full menu of American Contemporary cuisine, plus daily lunch and dinner specials. Phoenix City Grille is open Monday through Saturday from 11 a.m. to 10 p.m., and on Sundays from 10 a.m. to 9 p.m. For more information or to make reservations call (602) 266-3001 or visit www.PhoenixCityGrill.com. Fleming’s Prime Steakhouse & Wine Bar is pleased to celebrate Spring Break with a fantastic “break” for its guests: the iconic combination of a tender Filet Mignon and a sweet North Atlantic Lobster Tail, plus a starter course and a side, all for only $34.95* for a limited time. Now through April 7 at all Fleming’s locations, guests can start the Spring Break Celebration with their choice of the Wedge Salad with crisp iceberg lettuce with grape tomatoes, red onions and crumbled blue cheese or French Onion Soup baked with gruyere and parmesan cheeses. 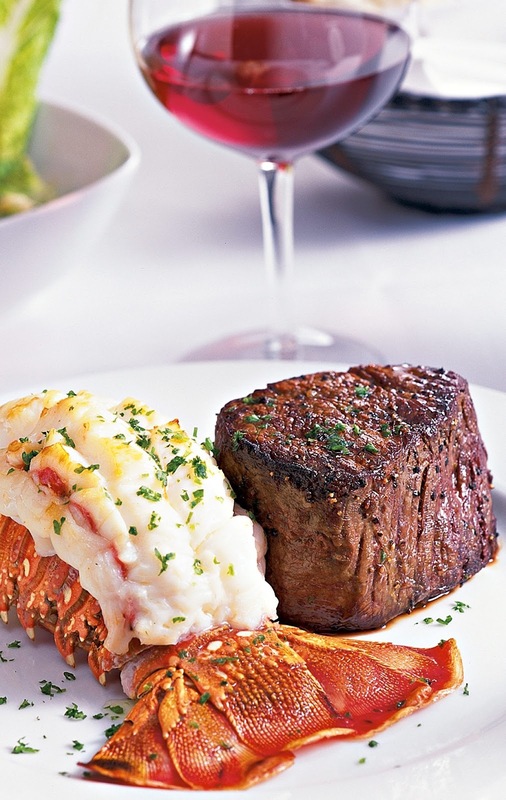 The generous filet mignon—Fleming’s leanest meat—and broiled lobster tail with drawn butter are accompanied by a choice of French Green Beans with shiitake mushrooms and porcini essence or Fleming’s Mashed Potatoes topped with blue cheese, parmesan-peppercorn or roasted garlic. The Spring Break Celebration is not on the regular menu and is available only upon request. There are four Fleming’s in Phoenix in Scottsdale (at Lincoln Road), North Scottsdale (at DC Ranch), Chandler and Peoria. 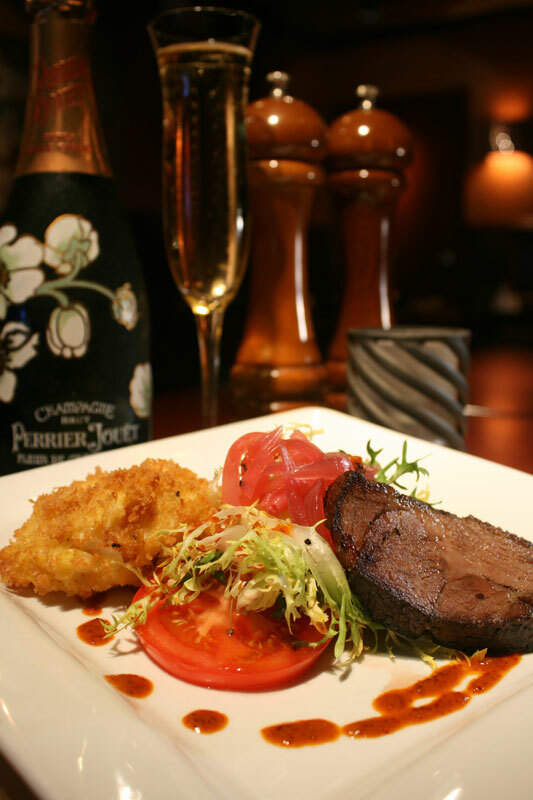 For details about your nearest location or to make reservations, please visit www.flemingssteakhouse.com. PHOENIX CITY GRILLE TO OFFER ANNUAL IRISH FARE PLUS A GUINNESS DRINK SPECIAL! St. Patrick’s Day is this Saturday and at Phoenix City Grille, that means customers will have the chance once again to enjoy the restaurant’s annually prepared and anticipated entrée: slow-roasted corned-beef brisket, served with a Chipotle-Dijon glaze, scalloped cabbage and rosemary roasted potatoes, prepared by Executive Chef Rory Hewitt. Plus, on Saturday, diners who wear green will receive $2 off a Guinness stout to accompany their meal! Since 1997, Phoenix City Grille has served as a highly recognized dining destination in Central Phoenix, recognized for its high quality menu items and service. The restaurant offers a full menu of American Contemporary cuisine, plus daily lunch and dinner specials. On weekends, Phoenix City Grille offers a brunch in addition to its regular menu. Posted on March 12, 2012 Categories UncategorizedLeave a comment on PHOENIX CITY GRILLE TO OFFER ANNUAL IRISH FARE PLUS A GUINNESS DRINK SPECIAL! Celebrate AZ Beer Week at BoomBozz Pizza & Taphouse! Here a list of what’s going at BoomBozz Pizza during Arizona Beer Week in Gilbert. Starting Monday, Feb. 20, they will pair two pints of a featured local craft beer with a large, award-winning, Famous Creations pizza for $20! At 5:30 p.m. each day a representative from each brewing company will also be onsite with additional beer samples and promotional items! For more details regarding the unique menu items and ingredients at BoomBozz Pizza visit http://www.boombozztaphouse.com/Menu/GilbertGilbertTownSquare/tabid/201/Default.aspx. Posted on February 20, 2012 Categories Arizona Beer Week, beer, BoomBozz Pizza and Taphouse, Gilbert, pizzaLeave a comment on Celebrate AZ Beer Week at BoomBozz Pizza & Taphouse!